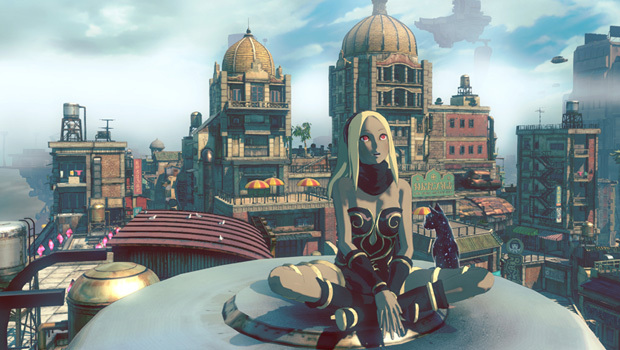 When it first came out, Gravity Rush was one of the most original, unique takes on the action-adventure game. In a genre so bloated, it takes something special to stand out, and Gravity Rush had that in spades, with its clever gravity shifting mechanic and beautiful world. There hasn’t been anything else quite like it – until now. Gravity Rush 2 is everything you could want from a sequel, taking everything that made the original so unique and taking it to new heights. Gravity Rush 2 is a direct sequel to Gravity Rush, but you don’t need to have played the first game to enjoy this one. In fact, I’d even say that Gravity Rush 2 is a better starting point if you’re new to the franchise, with a story that’s entirely self-contained and much easier to follow than the first. At the centre of the series is Kat, a superhero of sorts who can fly (kind of) by altering the gravity around her. However, at the start of Gravity Rush 2, she’s about as far from her “Gravity Queen” persona as possible. Her cat Dusty – the source of her power – is nowhere to be seen, and she’s eking out a living on a mining fleet. Naturally, things start to change when Dusty returns, Kat gets her powers back, and a series of bizarre events leads to her having to save the day once again. What transpires is a simple story of otherworldly good and evil. It’s a welcome change from the confusion of Gravity Rush, and being straightforward doesn’t stop it from being captivating. A lot of that is thanks to Kat herself, who’s so likeable and relatable that it’d be hard to not care about her plight. She’s happy-go-lucky, almost goofy, but that’s grounded by a sense of humanity and earnestness that stops her from ever being a caricature. When she goes out of her way to help people, it feels genuine, and not just because that’s the requirement for the task at hand. Her strength is in her compassion and empathy as much as her superpowers, and that’s always nice to see. Kat is a wonderful character, but the real star of Gravity Rush 2 is its world. The majority of the game takes place across two cities, Hicksville and Jirga Para Lhao, which feel real and alive despite their fantastical nature. Heksesville, which will be familiar to people who played Gravity Rush, has a Victorian feel. Stonework buildings tower over cobbled streets, trains run from borough to borough, and wrought iron decor instills a sense of industrialism. At the same time, it’s got pockets of neon night life now reminiscent of Tokyo, while the fragmented landscape of hovering islands gives everything an alien sensation. In contrast, Jirga Para Lhao is like South America mixed with the Middle East. It’s warm and lively, full of crowded streets and bustling marketplaces. the wealthier districts are marked by opulent mansions and bourgeois attitudes; Jirga Para Lhao is a place with a stark class divide, and all the problems that come with that. Still, it’s an inviting place that’s a joy to explore in a way that Hekseville – beautiful as it is – never could be. There’s a real sense of culture running through all of this, and that’s particularly apparent in the language. In Snippets of voice acting, both in cutscenes and some out exploring, you hear a tongue that sounds like a cross between French and Japanese. In particular, are signs written in script that looks like Katakana mixed with Sanskrit. These broad influences come together to create a world that’s unique, outlandish, but – most importantly – feels authentic. All of this narrative context and world-building comes together to create a perfect playground for the gravity-shifting shenanigans of Gravity Rush 2. The basic idea is simple: by tapping R1, Kat “turns off” gravity and hovers in the air, then tapping R1 again shifts gravity so that you “fall” in the direction you’re aiming. You can fall skyward to reach the tops of buildings, fall sideways to cover huge gaps of empty space between islands, drop of a ledge then fall up to the underside of an airship – the possibilities are almost endless. The shifted gravity keeps its effect when you land on a surface, letting you run up walls, traverse the undersides of bridges, or whatever else takes your fancy. It’s this freedom of movement that makes Gravity Rush 2 one of those rare games that actually benefits from an open-world design. Each city is its own self-contained “world” of sorts, and neither is as big or expansive as something like The Witcher 3 or Grand Theft Auto, but unlike those games, the thrill of exploring goes right down to a base mechanical level. This was true of Gravity Rush, but with an extra city to explore, Gravity Rush 2 takes that to new heights. It also expands Kat’s abilities with different traversal styles, Lunar and Jupiter, which affect the force of gravity around her. In Lunar Style, Kat can leap through the air even without changing the direction of gravity, while Jupiter Style makes her heavy enough to smash through obstacles that would otherwise be impassable. Neither style has a dramatic effect outside specific situations where they’re required, but it’s nice to be able to play around with them nonetheless. Smart level design has a lot to contribute, too. The cities may not be massive, but they’re full of nooks and crannies to explore, leading you to all sorts of treasures. Gems used to upgrade Kat’s abilities aren’t too abundant along the beaten path, but there are plenty to be found tucked away on rooftops and underneath islands. Often, the more valuable treasure is something less tangible – a stunning view, or some hidden piece of environmental storytelling. Couple all of this with the sense of place I mentioned earlier, and exploring and traversal without care or goals often becomes the most exciting part of this game. That said, I do wish there weren’t quite so many quests built around searching for a needle in a haystack, often without any sort of clues. Aimless wandering is delightful when it’s on your own terms, but frustrating as all hell when you’re trying to get on with a mission. On the subject of frustration, Gravity Rush 2 makes excessive use of one of the greatest sins in gaming: forced stealth sections in non-stealth games. I love stealth games, and I like it when games mix up their mechanics in interesting ways, but the medium has a really bad track record when it comes to forcing stealth sections into other genres. Stealth quickly gets tiresome without the right design – in terms of feedback systems, failure mechanics, AI, and so on – and it’s rare for games that aren’t stealth first and foremost to get that right. Gravity Rush 2 gets it really, really wrong. There’s no way of knowing where enemies are aside from actually seeing them, nor can you tell how close you can actually get before you get spotted. There’s no feedback of any sort, and nothing to facilitate a stealthy approach, making these missions an exercise in frustrating trial-and-error. It’s not too bad early on, where there’s room for error, but in the later stealth missions, getting spotted is instant failure. The most disappointing part about this is that it could work really well, if just a bit more care had been put into the design. Stealth games, fundamentally, are about creative puzzle solving, as you use your wits to slink through enemy hordes. Kat’s gravity shifting ability fits that sort of ethos wonderfully; by letting you do things like walking on ceilings or under ledges, it gives you a great set of tools for sneaking about. With something as simple as a radar or a way to tag enemies, and if the instant failure was forgone, the stealth missions could have been the best part of Gravity Rush 2. Instead, they’re the worst. That said, they’re really easy once you know what to do, so with a walkthrough at hand you can easily skip the tedium, and get back to enjoying everything else this game has to offer. And it really does have a lot to offer. This game is every bit as unique and creative as the original Gravity Rush, but with the scope to really bring those ideas to fruition. A captivating story with one of the most interesting and likeable protagonists around helps, as does the beautiful art style and music, but it’s the rush of exploring this world, with gravity at your beck and call, that really makes Gravity Rush 2 something to fall in love with. Gravity Rush 2 is developed by Project Siren and published by Sony Interactive Entertainment. It’s available now for PlayStation 4. An PS4 press copy was supplied by Sony Interactive Entertainment for this review.